Charting the long path from shock, trauma, and overwhelming pain, to a life that once again contains joy, love, and laughter, The Unspeakable Loss addresses the importance of self-care and also provides a needed view into how the death of a child affects siblings and other family members. 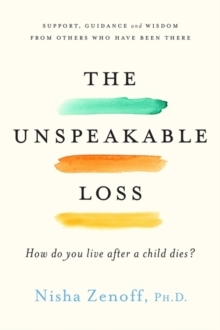 Written in a Q & A format, The Unspeakable Loss goes deeply to the heart of grief, answering the urgent questions that accompany loss. "Will my tears ever stop?" "Who am I now without my child?" "How can I help my other children cope?" "Will my marriage survive?" "Will life ever feel worth living again?" By directly answering the questions raised by grief, The Unspeakable Loss speaks wisely and compassionately, offering bite-sized chunks of wisdom in language the bereaved can absorb. Addressing parents no matter where they are in their grief cycle, whether newly bereaved or dealing with a death that occurred many years earlier, the book offers insight from other bereaved parents, as well as Zenoff's personal story. While books on grief have sadness at their core, the best ones also contain invaluable wisdom. The Unspeakable Loss emphasizes hope and recovery above all. While it doesn't flinch from the reality and pain of parental loss, ultimately it is a book about embracing life.